The F-35A variant of the Lightning II Joint Strike Fighter that Australia is buying could remain in service far longer than the anticipated 8,000 flight hours per airframe. Just how much longer, neither manufacturer Lockheed Martin nor the F-35 Joint Program Office in the Pentagon is yet prepared to say. But testing showed the F-35A airframe could achieve a simulated 24,000 flight hours or three full lifetimes. Lockheed Martin says that it has confidence in a potential service-life increase. Greg Ulmer, Lockheed Martin vice president and general manager of the F-35 program, said this durability testing gave men and women who fly the F-35 great confidence in the aircraft’s performance today and for decades to come. “We look forward to analysing the results and bringing forward the data to potentially extend the aircraft’s lifetime certification even further,” he said. Ground testing included a full-scale airframe durability test for all three variants, which were loaded in unique test rigs and laboratories to simulate ground and flight conditions. F-35 has a nominal service life of 8,000 hours with the test airframes required to complete two life-times of testing, or 16,000 hours. The F-35A airframe completed its testing at BAE Systems in Brough, England and the F-35B and C variants were tested at Lockheed Martin in Fort Worth, Texas. All three variants undergo final teardown inspections at the National Institute for Aviation Research in Wichita, Kansas. Australia is buying 72 F-35A Lightning aircraft, the conventional take-off and landing version, with the first two to arrive in country in December. The other two variants are for short take-off and vertical landing and the naval version for aircraft carrier operations. Ulmer said the transformational F-35 pushed the boundaries of engineering and physics with supersonic speed, agility, high attitude and angle of attack, weapons capacity, vertical landings, carrier operations and much more. With radar evading stealth technology, advanced sensors, enhanced weapons capacity, supersonic speed and superior range, the F-35 is the most lethal, survivable and connected fighter aircraft ever built, Lockheed says. “More than a fighter jet, the F-35’s ability to collect, analyse and share data is a powerful force multiplier enhancing all airborne, surface and ground-based assets in the battlespace and enabling men and women in uniform to execute their mission and come home safe,” the company said. The F-35 will last longer and it’s also getting cheaper as production ramps up. Lockheed Martin is looking at a unit price of US$80 million for the A-model. F-35 is also intended to be cheaper to operate than legacy aircraft. 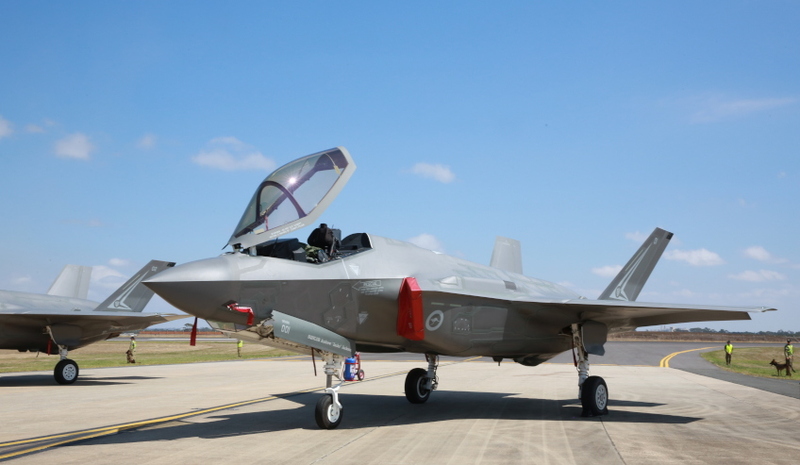 Neale Prescott, Lockheed Martin Australia director of business development, said F-35 was profoundly different to earlier aircraft in its integrated support system known as Autonomic Logistics Information System (ALIS ). That’s a software-based system designed to capture all aspects of aircraft use, warehousing of spares and certification of maintainers and operators. When the pilot finishes a mission, they will take the aircraft’s portable data device to the maintenance control section and plug it into a docking station. “The maintenance related aspects of the aircraft will be downloaded and then she [or he] will go back to her debriefing room for the classified discussion on the mission,” he said in an interview with Defence Connect. Prescott said that was very different from when his time in the RAAF looking after F-111s. “There we had to talk to the aircrew, we had to try to take very general observations around the aircraft performance and try and diagnose them and go through this very convoluted process,” he said. Prescott said that allowed support to be adjusted around the operational activity, with any necessary components in place and personnel prepared. “This is a fantastic extension of what we used to do but really enabled by a fantastic large data analysis system,” he said.